Like many other casino games, craps origins are a matter to some debate. There are several versions to the "true" history of craps, yet there are several facts that are accepted by all experts and historians. 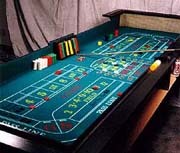 First, it is known that the craps game we know and play today originated from an ancient English game called Hazard. It is told that Hazard was first played by the crusading knights during the 13th century crusades. The rules were of course modified numerous times but it is still very easy to see the resemblance between our modern casino craps and that ancient game. The name craps comes from the French adaptation of Hazard. The French in their effort to distinguish themselves from Anglo-Saxon culture changed the game's name to craps using the English term crabs that signifies the lowest possible dice roll. There is some ambiguity regarding the way craps came to America. One version claims that Hazard has crossed the see to France long before the beginning of the American colonization. Then, the French colonists brought the game with them to a new continent where they formed the colony Acadia. Acadia was later conquered by the British and renamed to Nova Scotia. The Acadian settlers traveled across the land and were known as Cajuns when they finally came to Louisiana, their permanent home till to day. Another version says that first French colonists brought craps with them when they first colonized Louisiana. This option is quite likely as the French colonists are known to introduce several gambling games to the new world, blackjack among them. The game then traveled across the country on the Mississippi riverboats and evolved along the way. Although the history of the modern casino craps is quite brief the history of the dice games is almost as old as civilization itself. A playable, cubical dice was discovered in Egypt and is appreciated to be about 2600 years old. In fact we can easily track the origins of the dice to the roots of the Arabic culture. The Arabic word 'Al Zar' (also Azza) that is attributed to knucklebones also means 'dice' as dices were made out of shaved knucklebones. Dice games were also very popular in the Roman Empire. Caesar and Caligula were known to be avid dice players as many of their contemporary nobility. There is one person that changed the game of craps more than its thousands years of evolution and that is John H. Winn. Winn was a simple American dice maker who decided to develop craps further and take it to the next level of gambling games. Winn has added one simple feature – the players can now bet both in favor and against the shooter. This development created the Bank craps which is the craps variation we can see in every modern casino.